(Text automatically translated) New and cozy apartment in an ideal position to reach the most famous beaches and cliffs of the coast of the city. Tastefully furnished and equipped with all amenities, perfect for couples and families with one or two children. Property is equipped to a very high standard. Excellent property for a small family or two couples. Very comfortable with lovely outside area for eating meals/relaxing in the evening. 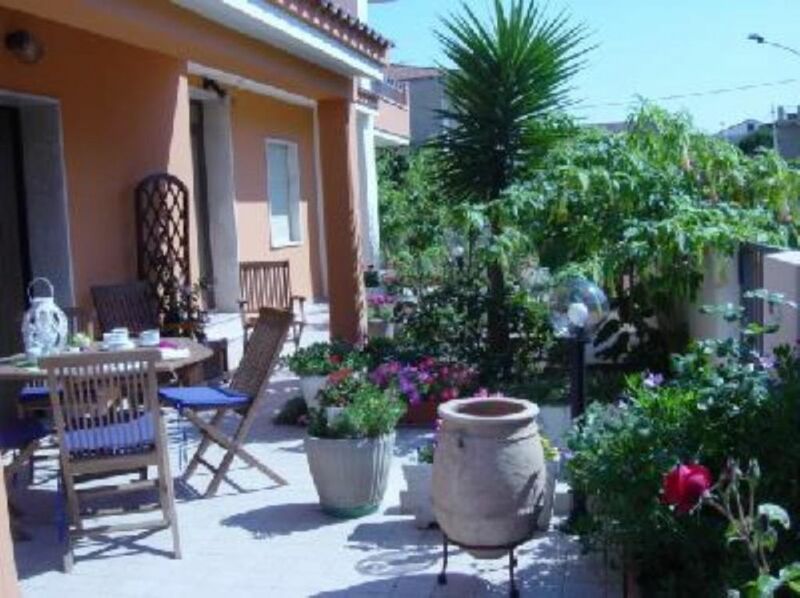 Situated in a quiet, friendly neighbourhood about 15 minutes walk from old town Alghero. Approximately 20 min walk to the beach. Lovely gift of local produce on our arrival from the owners. The apartment was very clean and beautiful decorated. It was very spacious for a family of 4. We enjoyed to the pleasant 15 min walk to the town center, and there were plenty of cafes and grocery possibilities along the way. Mr. Parisa made us feel very welcome and gave us many tips on where to visit and eat. We highly recommend the degustation menu at La Saleta (not directly in the old town but worth a visit for excellent local cuisine at a very reasonable price!). The surrounding area is beautiful with wonderful beaches and crystal clear water. Would love to return one day. Ho trascorso una settimana bellissima in questo appartamento della signora candida. Un accoglienza perfetta un appartamento stupendo dotato di ogni comodità i proprietari ci hanno fornito indicazioni utilissime per ottimizzare al meglio il nostro soggiorno. Che dire peccato che sia già finita, consigliatissima! "This was the best self catering property we have ever rented on holidays. The property is beautiful and well worth the money we paid for the week. It had everything we needed and everything which is listed on Homelidays website. Furthermore the property is in a very quiet residential area of Alghero. It is approximately 15 minutes walk from the old town and beach. For some people this may be too far but we hired bikes and it was not an issue at all for us. If you would prefer to stay in the old town of Alghero or closer to the beach be prepared to pay a lot more for the week with fewer amenities and excellence than this property. The owner of the property was so generous and helpful to us and made our stay even that more special. She was there to greet us when we arrived and even lavished us with wine and local delicacies! What more could you ask for in renting a holiday property!!" Appartement très confortable,bien situé à proximité du centre. Terrasse agréable. Notre hôte très sympathique a été de bon conseil pour visiter la région. Bellissimo appartamento arredato con tutti i confort compreso climatizzatori, TV in ogni stanza e wifi veloce. Pulizia eccellente, tranquillità assoluta, parcheggio sempre disponibile. Tutti i servizi a portata di mano e facilmente raggiungibile il centro storico. Candida e Salvatore sempre presenti e disponibili come mai riscontrato nei nostri soggiorni in Sardegna. Da consigliare a tutti. Sicuramente ci torneremo anche perchè Alghero è veramente una bella città così some il suo mare. (Text automatically translated) Apartment not far from the city center and places of interest, such as theater, cinema, shops, bars and restaurants of the place. Nearby is also a gym with sauna and swimming pool making it ideal for those who want to shape while on vacation. Tariffe scontate in relazione alla durata .Tariffe in funzione del numero di persone . Caparra richiesta alla prenotazione Saldo in contante al momento della consegna delle chiavi da parte del proprietario non presente in loco PULIZIE FINALI euro 50:00 Check out by 10; 00 Check in from 15;00.